Former Oregon cornerback Ifo Ekpre-Olomu continues his road to recovery after suffering a torn ACL just weeks before the CFB Playoff National Championship game. While the three-time All-Pac-12 cornerback has missed opportunities to perform at the 2015 NFL Combine and Oregon’s Pro Day, his talents have not gone unnoticed and his stock continues to rise amongst NFL scouts and draft analysts. In particular, the Denver Broncos – who will return 2015 Pro Bowl cornerbacks Chris Harris Jr. and Aqib Talib, as well as former Duck T.J. Ward at safety – may be looking at Ekpre-Olomu as a hidden gem in the second round. 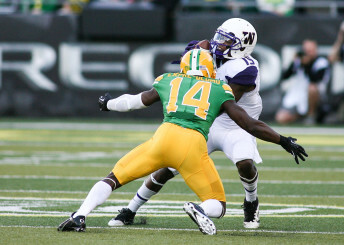 Ekpre-Olomu would be a great fit for a Denver Broncos secondary filled with all-stars. In Gary Kubiak’s first year as head coach of the Broncos, the longtime Houston Texans head coach is well known for his nickel defense which allows safeties and cornerbacks to play a more dynamic role in the secondary. Along with Ekpre-Olomu, the Broncos will be looking to bolster their offensive line. Former offensive linemen Jake Fisher and center Hroniss Grasu have appeared in mock drafts as potential first- and second-round selections, respectively.